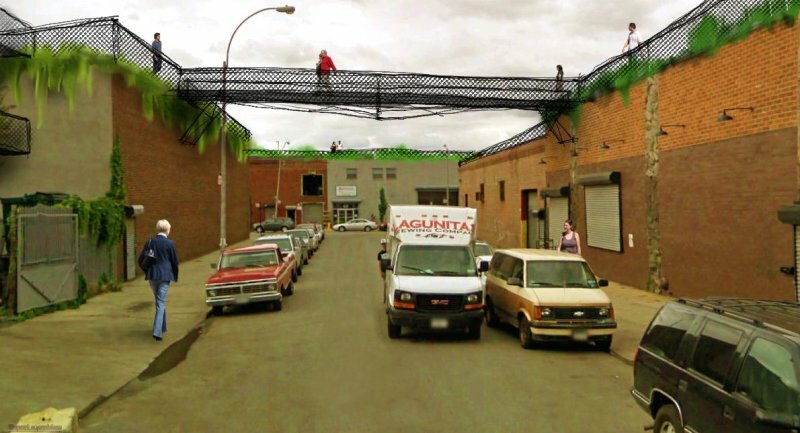 This is our entry for the Gowanus canal competition. Give access to your roof or your grounds. The central idea is to allow pedestrian circulation on all the intervention area, together with a significant augmentation of green areas. Pedestrians will be able to transit through these parcels, as if it was a big park with different levels. The parcels in the intervention area continue as private properties of their respective owners, the difference is that they allow pedestrian transit. The urban blocks will only be defined by their bording streets, while pedestrians will be able to cross them in diverse ways. Acces can be permitted in several forms: through gardens or parking lots, through ground floors or through flat roofs. The owner of an area can choose which alternative to use, providing the whole vertical projection of the parcel as accessable pedestrian way. 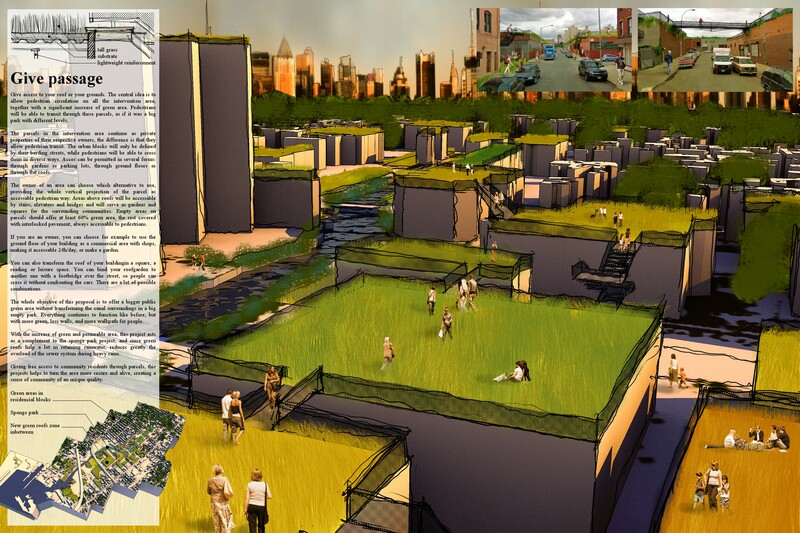 Areas above roofs will be accessable by stairs, elevators and bridges and will serve as gardens and squares for the surrounding communities. Empty areas on parcels should offer at least 60% green area, the rest covered with interlocked pavement, always accessable to pedestrians. If you are an owner, you can choose for example to use the ground floor of your building as a commercial area with shops, making it accessable 24h/day, or make a garden. You can also transform the roof of your buildingin a square, a reading or leisure space. 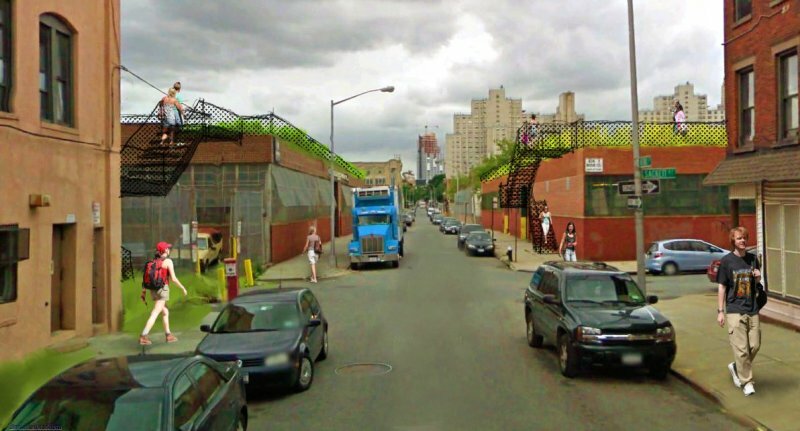 You can bind your roofgarden to another one with a footbridge over the street, so people can cross it without confronting the cars. There are a lot of possible combinations. The whole objective of this proposal is to offer a bigger public green area without transforming the canal surroundings in a big empty park. Everything continues to function like before, but with more green, less walls, and more walkpath for people. With the increase of green and permeable area, this project acts as a complement to the sponge park project, and since green roofs help a lot in retaining rainwater, reduces greatly the overload of the sewer system during heavy rains. Giving free access to community residents through parcels, this projects helps to turn the area more secure and alive, creating a sense of community of an unique quality.